Driving back home the other day after work I happened to pull up behind a pickup truck. I noticed, dangling from the hitch receiver on that truck, a plastic replica of testicles. What the hell? When I got home I hit the internet and discovered these are called Truck Nuts. Outside of demonstrating very poor taste in decor, what is this trying to say? What meaning is intended? I go to a lot of UGA baseball games, have been for years. I noticed years ago that the Dipping Dots cart pronounces that Dipping Dots are the 'Ice Cream of the Future'. When does that future arrive? I have yet to see Dipping Dots in a grocery store along with the old fashioned and terribly obsolete Blue Bell ice cream. 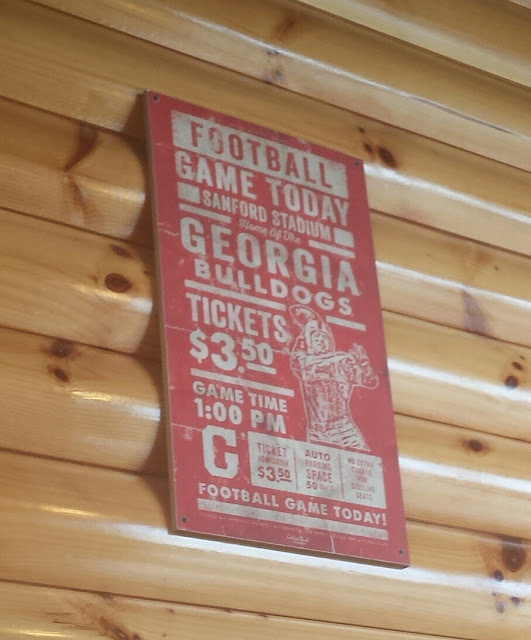 Football tickets for $3.50 and parking for 50¢ -- can you imagine? Big Moe's Outlet: I just noticed this store open at 3190 Atlanta Highway, the shopping center with Ingle's and Big Lots. It appears to be a furniture store. Does anyone know much about it? Ingle's: The Ingle's grocery store is a mystery to me -- why is it such a ghost town? The parking lot is mostly empty most of the time, they have about two registers open, and the customers are sparse. Is there simply too much competition in the area? Is the produce department inadequate? Are the prices too high? Does anyone follow this blog anymore? The tire amnesty held in Oconee County recently gave me an idea. Citizens were allowed to drop off old tires at recycling centers without paying a fee. The county lost a little revenue, but the amnesty reduced the number of illegal tire dumps and the mosquitoes breeding there. It’s a trade-off. Half of us sure would love to put Trump voters through a gauntlet of recrimination. But it would be better to all come to terms with the frightening nature of a pinball president careening through the White House stopping to tweet – ding! ding! – then watching Fox News – ding! ding! – and onward, heedlessly. Let’s declare an amnesty period so that we can – together – address the many problems we face in the world. I've never really stopped to think about how unique North Avenue is at its southern end where it's divided under the railroad trestle. I have thought about the awkwardness of its intersection with Dougherty Street and Thomas Street, though.